With removable side panels for easy wiring. Ignition protected. Use as main disconnect switch. 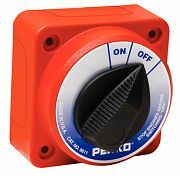 Red plastic housing with large black plastic knob. For use with systems under 50V - 315A continuous/450A intermittent. Depth: 1-7/8". Size: 3-7/8" x 3-7/8".